I find a lot of people making cauliflower mashed ” potatoes” these days. 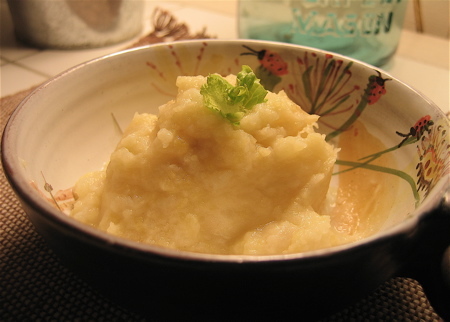 Another fun recipe you can make when you are craving that sort of food is mashed turnips. Although it has a very distinct taste ,unlike the cauliflower, I find it rather tasty. It is a great side dish. 1. Steam turnips in large saucepan until tender (20-25 minutes). 2. Place in mixing bowl. Mash with hand masher. Set aside. 3. Combine almond milk, butter and salt in small saucepan over high heat until liquid is reduced by half (about 5 minutes). 4. Pour liquid into mixing bowl with turnips and whip with electric mixer on lowest setting until smooth but not puréed. 5. Season with pepper. Garnish with parsley. yes you are so right. I changed it. thanks and enjoy!!!! Need a lactose free recipe and as your heading said, “dairy-free”, I thought I found a recipe I could use. Big problem is that your recipe utilizes butter which is a dairy product. I have looked and butter contains a minuscule amount of lactose, but unfortunately I am one of those who cannot risk ingesting any. By any chance have you tried this recipe with any types of oil? If you have, I would love to know the results. If not, I will give it a try and let you know. Try it with coconut oil. Should still be delicious!